New Englanders are always cursing. But a colorful profanity uttered by some stero-typically taciturn old Yankee is usually more humorous than menacing. Yet, true maledictions (the opposite of benedictions) have frequently been spoken on New England soil, curses intended to invoke evil, injury, or total destruction against other people. 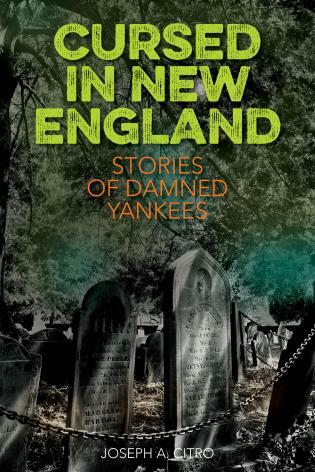 Stories about preternatural revenge are numerous in Yankee lore, with each New England state providing its favorites. You’ll read about curses that were followed by the strange disappearance of a father and daughter in Rhode Island, mysterious afflictions in Massachusetts, a river of death in Maine, an unaccountable blight in New Hampshire, unexplained madness in Connecticut, and other eerie happenings from New England’s colorful history. Some are well known, at least regionally. Others are nearly forgotten. Within these pages, storyteller Joseph A. Citro vividly brings these tales to life, letting us decide if these tales of woe were bad luck or . . . something else. Writer Joseph A. Citro has done a lot to keep Vermont's history and folklore alive in popular culture. His books include five novels of suspense, three volumes of historical oddities, a collection of regional humor, and a travel guide. A native of Chester, Vermont, he has taught in local colleges, lectured widely, and has appeared on regional and national radio and television. He lives in Burlington, Vermont.